I remember back in the day when all I had to do was pop my One-A-Day Vitamin, and I was good to go. Now I have to fill this up every week. Fiddledaddy found it for me back in the geriatric section of Wal*Mart. So that I can remember at lunch time, if I took my morning pills. You know what happens to the mind when it gets old. It is not unlike a sieve. And for the record, I’m still clinging to 49. I just play a 97 year old on my blog. Those pills are just for one week. And I place the blame square on Dr. Oz and his show which told me which vitamins I needed to be taking daily, in what doses, or else horrible things would begin happening to my body. And then in true Dr. Oz form, he has show and tell to drive home his point. Besides the regular vitamins, I’ve added some extra ligament and joint boosting offerings. And then following surgery last week, I have the requisite happy pills. Oh, and an anti-biotic and Celebrex. Appetizing, no? And did you notice how I have to write on the tops in black permanent marker how many to take each day, so that I DON’T HAVE TO PUT ON MY READING GLASSES. Anyhoo. Celebrex is something that my doctor is adamant about me taking for all the knee inflammation. The night of my surgery, while I was experiencing the joys of nausea, Fiddledaddy looked up the possible side affects of Celebrex and began reading them off to me. While I lay helpless, unable to escape. I told him that I didn’t want to know, remember, avoidance is my favorite coping mechanism. But being Fiddledaddy, he could not help himself. I will now quote from the list of possible side effects. Keeping in mind, that several times during his diatribe, I requested that Fiddledaddy JUST STOP. He did not. There was more, but his delivery was cut short when I had to yell above him to be heard, GET ME THE THROW UP BOWL. The Throw Up Bowl – not to be confused with the Popcorn Bowl. Fortunately it was nothing resembling coffee grounds. So I guess I dodged that bullet. I’m going to go take one of my happy pills, so that all of this is just a fuzzy memory. Because I’m pretty sure I experienced every one of those side affects in the span of the 5 minutes in which I was alerted to them. Someday soon, I’m going to go back to the good old days of popping a Flinstones Chewable first thing in the morning. Right after my Geritol. 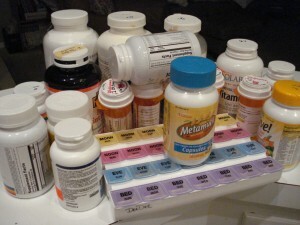 Yeah, the inside of 1 of my kitchen cabinets looks like a pharmacy moved in. With my diabetes, high blood pressure, high cholesterol, and hypothyroidism it seems all I do is take pills. Toss in the Vit D/Calcuim & estrogen after the hysterectomy and I’m a mess. Plus I have to take some at night, some 30 mins before eating, some after eating & I need one of those boxes! Oooph, my husband has a personal pharmacy too, with requisite pill box. Thank you, Lord, that I am still healthy! This is a terrible thing to say, but, it could be worse. My husband and I were having lunch one day when an unbelievably loud foursome arrived at the next table. Two beautiful but obnoxious young women, a young man and a very, very old man in a wheelchair. One of the young women fawned all over the old man, making it clear it wasn’t a father/daughter relationship. This poor (or maybe he was happy?) 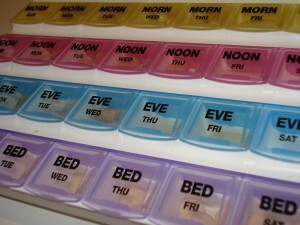 old man had 3 of those same pill boxes you used in your picture. While they ate lunch he must have taken at least a dozen different pills, the young girl feeding them to him one at a time. The lunch pills wouldn’t fit in one pill box, wouldn’t fit in two, it took all three to contain the pills for one time period! I guessed that many of those pills were an attempt to keep up with these young people. I also imagine that several of the pills were to counter the side effects of the other pills. It was just a very sad scene to see. I hope you are feeling better soon! One thing about all of this is that God is using this opportunity to teach me to be grateful for my health. And to never stop counting my many blessings! If it is any reassurance, I took Celebrex before all the crazy stuff about it increasing the risk of heart attacks and it was fine. And you know the increased risk of heart attacks is not great. The tarry stools thing is in case you have stomach bleeding, and the good thing about Celebrex is it is MUCH LESS likely to cause that than ordinary aspirin or ibuprofen. That is why it was developed in the first place, to be SAFER than those. 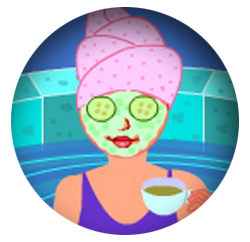 So relax. Save your worrying for the infection. OK not to kick you while you are down, but that was just funny! I’m so glad to know someone else a specific bowl or mini trash can as we do to throw up in. Even better, like you needed more details, we line our trash can so when we are done we just tie it up and trash it outside in the big trash can. Hope you are feeling better soon!! Oh yes..drug interactions can be scary stuff. Just do your own research because doctors just don’t always know best. And our puke bucket is the one they sent me home with from the hospital with the first kid. What can I say…it was free!